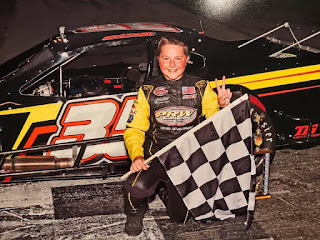 The Racing Times (AROUND THE TRACK): Andrew Molleur "The 14-Year Old Veteran"
Andrew Molleur "The 14-Year Old Veteran"
I had a chance to chat racing with 14-year old Andrew Molleur and one thing you tend to forget is that he’s only 14-years old. The way he handled himself was like he was a seasoned veteran. Well if you look at his stats he’s kind of a seasoned veteran. Being only fourteen and he started his racing career at the age of four he’s got years under his belt on the track. 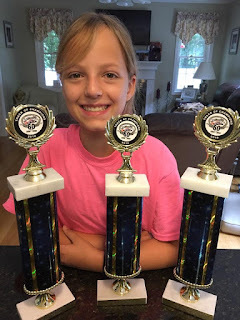 What can you accomplish in ten years of racing? For Molleur try 286, A Main Feature wins, USAC and QMA National Championships and an INEX State Championship. That’s just a start, add to that list a Little T Novice Cup Race win, an NC National LT A win and he even kissed the Bricks at the Indianapolis Speedway by taking a win there. Let’s turn back the clock and see how Andrew got involved in racing. It started when Andrew’s dad took him to a local dirt Go-Kart track and basically got hooked. Andrew took his first green flag at the age of four at the Richard Shelton Speedway in a Kid Kart, the outcome was a third-place finish. In 2017 Andrew is having a banner year. 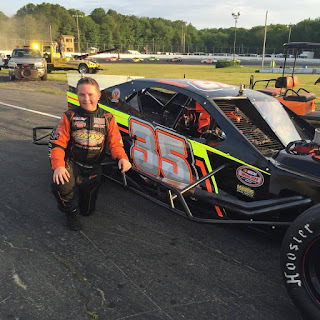 He got two wins in the SK Lite Modified Division at The Speedbowl which he considers his home track. 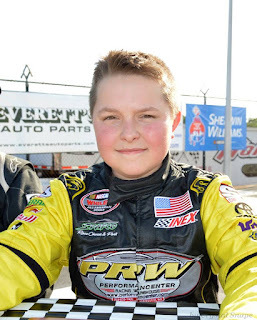 Andrew is leading candidate for Rookie of the Year honors in the Exit Reality Modified Touring Series and is also in contention to be one of the five drivers to compete in the “Sunoco Quest for The Cup” in the series. Also depending on his schedule, he does run the Valenti Modified Racing Series as well. In the Exit Reality Modified Touring Series, the series has four more events on their schedule, with two of them being at The Speedbowl. This could fall right into Andrew’s plans. He has multiple wins there and countless laps around the shoreline oval can only help him along in the series. Andrew will be attending Amity High School this fall but with racing taking up about ten months out of the year, Molleur is really limited on outside activities. When he can squeeze it in you can find him playing basketball, bowling or even mountain biking but leave it up to Andrew, the race track is where he wants to be. When asking Andrew what he would change in racing, he responded: “Add more races”. So, if anything Andrew is a true racer and like any driver is looking to move up in the ranks of auto racing. Andrew who is following in his dad’s footsteps in racing shared the #35 that his dad ran. The Black, orange and yellow colors are considered Team colors and that’s the scheme Andrew runs. The car is a Spafco built with the horse power supplied by RAD. Kenny Barry calls the shots on the Mike Molleur owned modified. Helping on both cars (SK Lite and Modified) are Joe Turiano, Tom Franciome, Tyler Barry, Steve Butova, Kyle Traynoe, Joe Campbell. Matt Swanson, Bernard Molleur, Benarhi Tovar and Mike Chauvin. What’s surprising is the team really doesn’t have any sponsors, so if anybody wants to sponsor a car, check out Andrew Molleur before going to somebody else, he’s the driver people are talking about. Talking goals with Andrew, which his responses were reasonable. “Finish every race, to run nice and clean (the way I want others to race me) and a few more wins and championships as well as taking the Rookie of the Year award in the MTS. The run you clean part is true; this past weekend Andrew was battling with another driver (who was also 14-years old) for the win. Andrew racing on the outside and Ethan Durocher running the inside. The duo battled lap after lap as the two never touch or banged. You would never know the ages of the two after seeing them run. Earlier I talked how Andrew and how he handles himself, and when we discussed what he wanted the fans to know about him, his response was “I love what I do, and racing is all I think about. I’m also very fortunate to be in the position I’m in to do what I love,” explained Molleur. Next time you’re at The Speedbowl or a Series event check out the moves of the black #35 modified and no he’s not a veteran. He’s only fourteen running like a veteran.